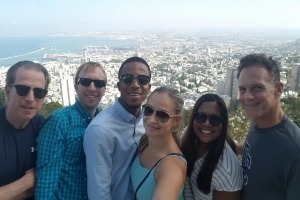 John Ampiah-Addison (pictured third from left), classmates and professors enjoying their time in Israel. I never dreamed I’d travel to Israel during graduate school. But, through the Full-time MBA Program’s global consulting project, I went on the trip of a lifetime. The global consulting project – both the greatest highlight and challenge of the program, thus far – paired me and a team of my peers with Voiceitt, an Israeli bio-tech startup. Our assignment? Develop a go-to-market strategy for one of their upcoming products. After conducting our initial research in the classroom in Washington, DC, we traveled to Tel Aviv for two weeks to meet with the company and explore the city. Voiceitt develops applications that translate unintelligible speech into easily understandable dialogue. We created a marketing plan for Talkitt, an application designed to help individuals with speech disabilities communicate clearly. During our first week, we met with Voiceitt to discuss our findings, and plan next steps. Week two was all about hands-on learning; we did a ton of beta testing to gain a deeper understanding of how the application works. What struck me the most was how smart and passionate Voiceitt’s team was. They are genuinely committed to developing products that help people. Working with a start-up was inspiring, too, because they are constantly exploring new ideas. Developing their go-to-market strategy also taught me that sometimes your work is ambiguous. There’s a lot of ways you can approach a problem. There isn’t always one clear path to success. Learning this helped me tackle our project more creatively, and prepared me for the complexities of professional life outside of school. Our hotel was right next to the Mediterranean Sea in Tel Aviv. I spent time on the beach when I had some free time, and even rented a bike to ride into the city. What really stuck with me is the food, though. Shakshuka, an Arabic dish of poached eggs with cumin-spiced tomatoes, peppers and onions, is now a new favorite. We also visited Jerusalem and Haifa, and did some unforgettable sightseeing. I got to tour the Bahai Temple’s beautiful gardens, do a sunrise hike to the top of Masada, and even got to swim in the dead sea. As future global business leaders, it’s imperative that business students learn how to make good decisions under uncertain circumstances. I gained first-hand experience with this working with Voiceitt. Developing a marketing strategy for a newly developed application was anything but clear-cut. Would our plan be successful in the marketplace? How would our target audience react? Will the app need to be adjusted if sales don’t go well? Voiceitt’s real secret to success, though, is their passion for excellence. Each and every team member I worked with was fully invested in making Talkitt the best it could be. They were dedicated to their work, and passionate about the impact it could have on the word. This is an attitude I hope to channel into every professional environment I enter. And, if I can put as much passion into my future work as I did into the global consulting project, perhaps I’ll have another chance to positively impact the world, too. Visit us online to learn more about the global consulting trip and Kogod's Full-time MBA Program.